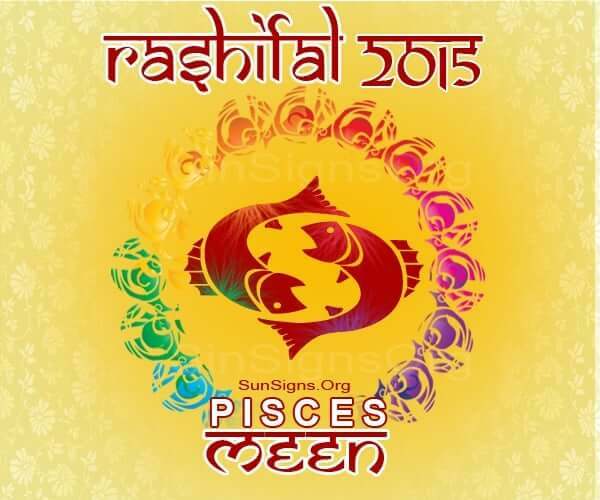 Meen Rashi 2015 predictions show that the year will start auspiciously for you. There might be a few problems in the second half of the year. There might be stress in all aspects such as physical, mental and financial fields. Do not indulge in unethical methods to achieve your goals. With hard-work and strong will-power everything can be overcome. The career predictions for 2015 Meena Rashi are excellent for the first half of the year. If you are thinking of changing your job, you will get many opportunities. The job change will also involve increase in work load as well as responsibilities. The Meen Rashifal 2015 predicts that students will do well academically during the first half of 2015. The 2015 Bhavishya Rasi astrology forecasts warn that businessmen should refrain from venturing into new projects during the second half of 2015. Possibilities of cheating by business partners exist. You have to be very careful while dealing with your colleagues. During the first half of the year, Meena Rasi natives will make handsome profits. 2015 Horoscope financial forecasts predict that cash flow will be abundant for the Meena Rashi in spite of all the challenges you are facing. Postpone all your financial commitments and investments to a future date. Year 2015 is superb for single people of the Pisces zodiac sign in matters of love and relationships. This is the right time to find true love. Family life will be volatile in spite of some religious celebrations foretells the Rashiphal 2015 horoscope. Relationship with your wife will be stressful. You will be put off by the behavior of some family members. Travel is indicated but will not be beneficial. The 2015 Meen Rashifal foresees that you will go on long trips with your family and fiends. The Meena Rasi 2015 predictions also show that health requires your attention and diet should be controlled to avoid problems. Sir i am p.satheesh , 04-11-1984, eve: 4:10, chittoor and I have many problems in my life and there is no job in 4 year’s pls give me solution.